It was a cold, sunny day – the last of March – when Yeabsra arrived in Toronto. 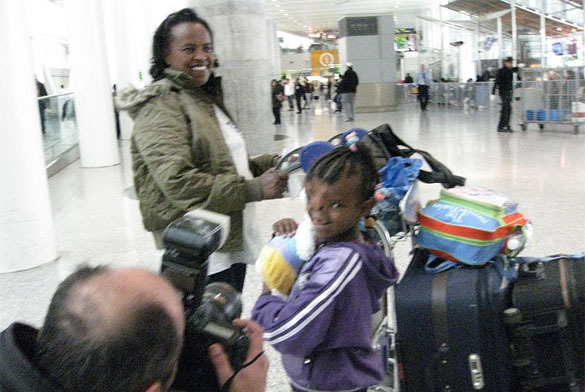 The five-year-old had never been outside of Ethiopia, but she bounded down the ramp at the airport. Even after a 20-hour journey, she had energy to spare. She ran into our arms, though she’d never before met us before. 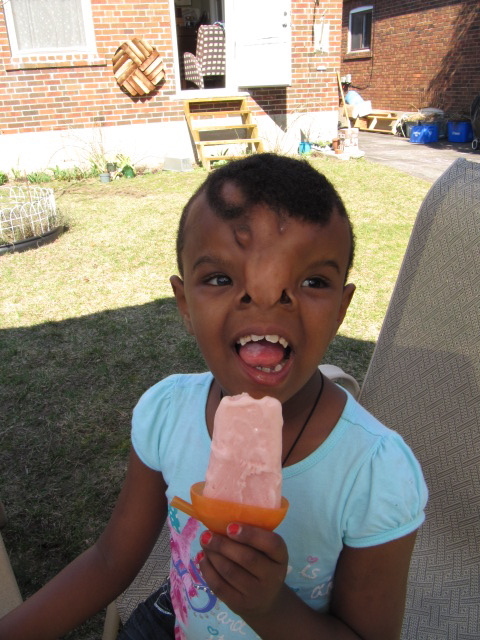 Yeabsra, accompanied by her mother Aynalem, had flown to Toronto from Addis Ababa for reconstructive craniofacial surgery at Toronto’s Hospital for Sick Children (SickKids). Transforming Faces funded transportation, accommodation and translation costs, and SickKids’ Herbie Fund paid all medical costs. Dr. Christopher Forrest, Chief, Division of Plastic Surgery, and his team, donated their time. After a 12-hour surgery in April 2011 to repair the facial cleft, Yeabsra returned home in June to her father and little brother. Program Manager Laura Lewis-Watts shares a hug with Yeabsra. Yeabsra continues her healing after the initial operation. 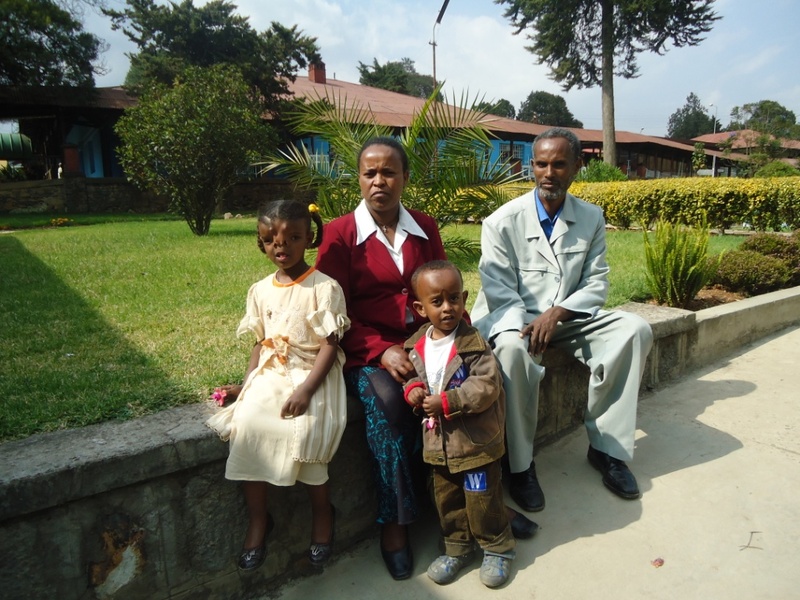 Yeabsra and her family in Ethiopia. 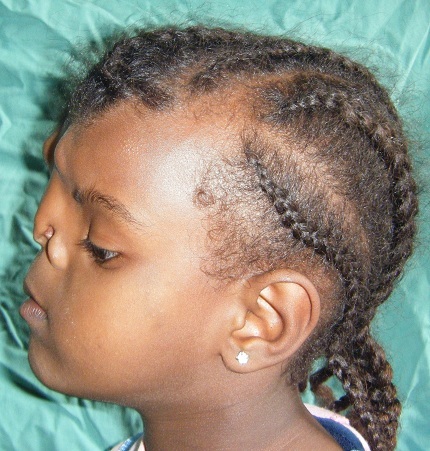 While in Ethiopia, an infection developped and she needed to return to Canada in January to repair her forehead and further build up her nose. “The operation will help her have a better future,” says Aynalem, her mother, who adds that she is very grateful for the chance for corrective surgery. She returned, full of enthusiasm, in January and underwent three more surgeries – the first two to repair her forehead and the last two to rebuild her nose. 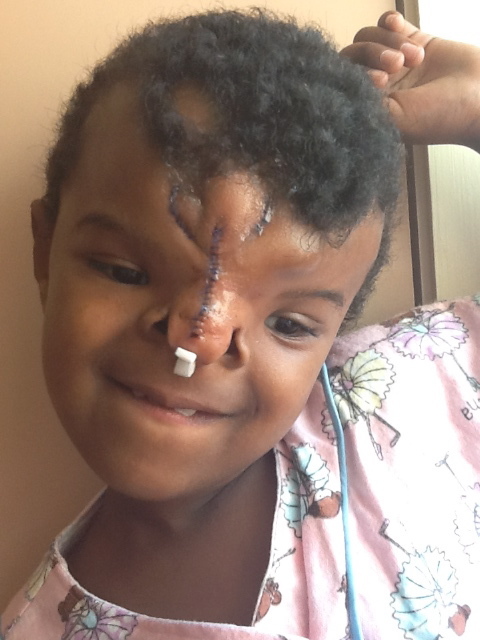 She will be undergoing the last of these surgeries in Canada on Monday to rebuild her nostrils. 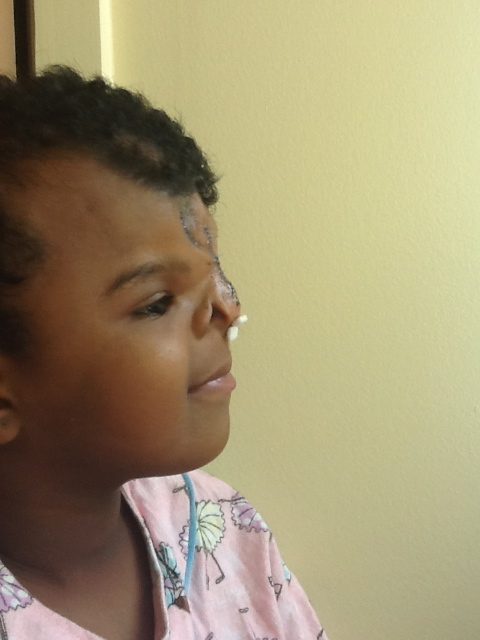 Yeabsra and her mother returned to Toronto on January 27, 2012 for a final nose reconstruction surgery at SickKids. 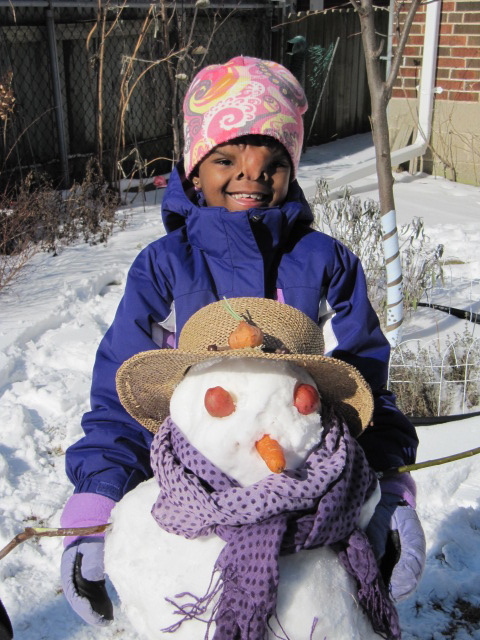 Yeabsra’s poses with her first Snowman. Then and now: Yeabsra will be undergoing a final surgery to rebuild her nostrils on Monday, June 11, 2012. Yeabsra is one of many children whose lives are transformed through our work. Because of your support, we bring comprehensive care to children and families facing the social and physical challenges of cleft lip and palate, and other cranio-facial conditions. This care is life-changing. Some children with unrepaired clefts stay away from school – daily – to avoid bullying and teasing. They have trouble speaking and hearing. Their parents worry for their future, knowing marriage and a normal life is often out of reach. Transforming Faces aims to help these children with free, local cleft care. We work in some of the most isolated communities around the world because we believe surgery and rehabilitation should be in reach for every child born with a cleft. When local care was not available to treat Yeabsra’s complex case, we could not turn our backs. 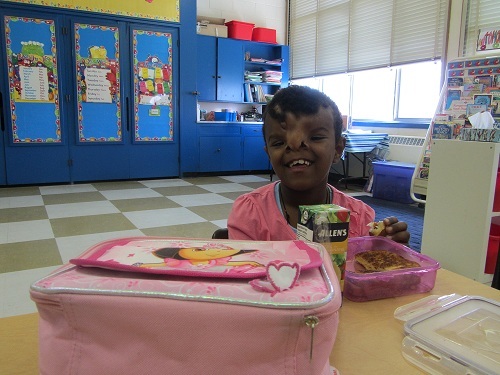 For the first time in our history, we brought a child to the care she needed, rather than bringing the care to her. 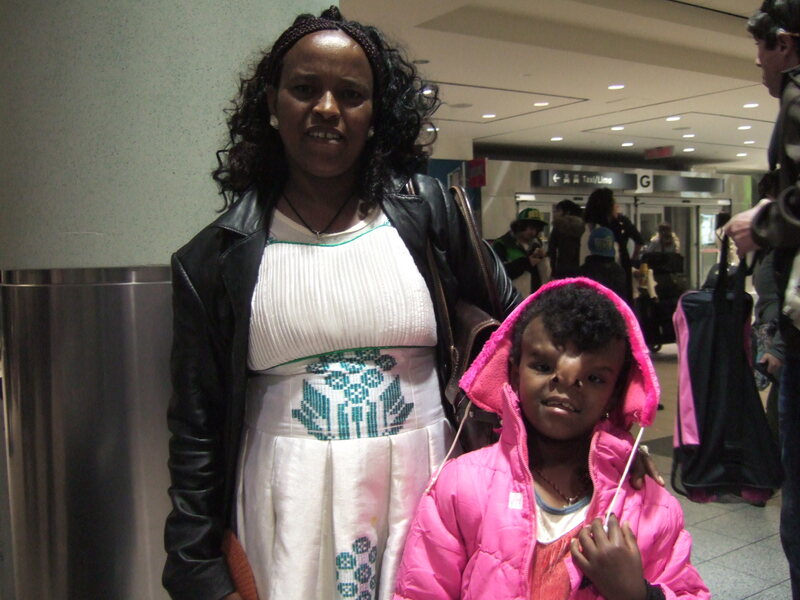 Toronto-area volunteers, including those from the Ethiopian community and our supporters, came out in full force to make Yeabsra and her mother comfortable throughout their emotional time in Toronto. Yeabsra enjoys an ice cream and celebrates Easter at her host family’s home. In contrast to the shocked stares her condition elicited in some, Yeabsra put a big smile on the faces of those lucky enough to meet her. In helping to transform her face, people involved in her care were transformed as well. We thank you for helping to bring quality cleft care to Yeabsra and all the children we support. 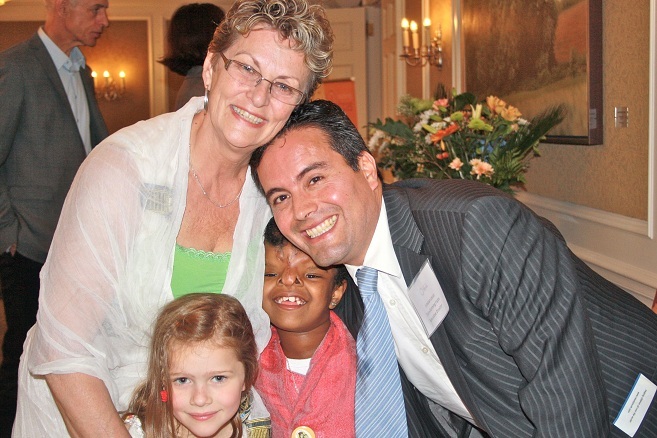 Jeanne Mott, Yeabsra’s host, with her granddaughter Moira, Yeabsra and Esteban Lasso. Yeabsra attends school at MPS Etobicoke. As she heads to her last Canadian surgery, her journey continues. Watch Yeabsra on Citytv or stay tuned to our blog for updates. To help Transformi​ng Faces fund Yeabsra’s visit, please consider donating. Thank you!